Apple has continually talked about the number of companies that have been testing or deploying iPads to its workers – and if you look around many workplaces today, you’re likely to see at least one or two iPads. If you’re craving more than anecdotal evidence that the iPad is a serious business tool, however, a new ChangeWave study offers plenty of solid proof. 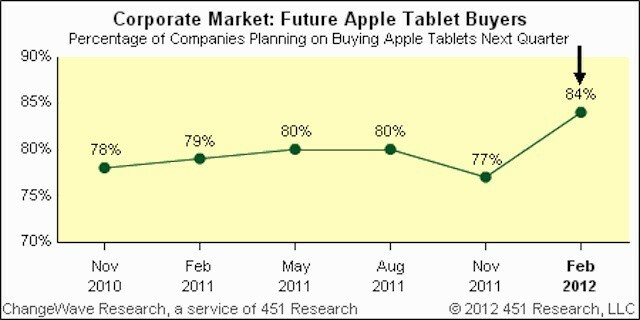 The study shows that 84% of businesses looking to deploy tablets are planning to buy iPads within the next three months. That follows an earlier study that showed the iPad commands 96% of the business tablet market. The ChangeWave study is based on a survey of IT purchasers at 1604 companies. Of that total, one in five (22%) are planning to buy tablets for their employees over the next three months, and 84% are set on buying iPads (a seven point leap from the last ChangeWave survey from November). Companies planning to go with competing tablets are spread out across a range of devices/platforms with devices from Samsung being the most common followed by Amazon’s Kindle Fire (which seems like an unusual choice for businesses if you ask me). RIM’s PlayBook was towards the end of the pack in front of just Lenovo and Motorola. Not only is the iPad wildly more popular with business than its competition, but the release of the new iPad has actually pushed interest in every other tablet by at least a couple of percentage points. Although the survey didn’t provide any details on the reasons that businesses are choosing the iPad and barely considering other options, it’s easy to guess that the device is a more polished product that’s popular with users. It also doesn’t have the update fragmentation issues of Android devices, often cited by IT professionals as a reason to avoid the platform, and it has a solid selection of enterprise management capabilities. 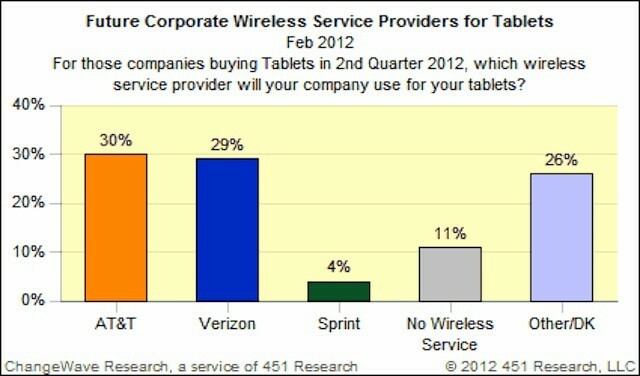 The study also looked at which mobile carriers companies prefer with respect to the iPad and other tablets. Not surprisingly, it shows that AT&T and Verizon are evenly matched as the most preferred carriers (30% and 29% respectively), while Sprint is used by only 4% of companies.